“Nothing,” was my reply. “Tish told me not to bring anything.” “What?!? Why’d you do that?” he asked his wife. It seems Alex had been hoping for the pumpkin cake I’d made last fall for him, and was disappointed when it didn’t appear. I promised to bring one the next time I saw him, which turned out to be last weekend for their kids’ birthday parties, and he was appeased. 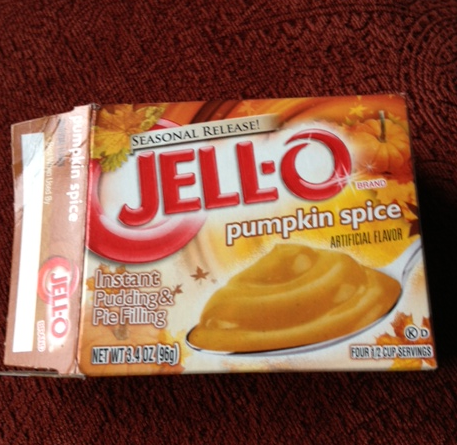 I saw some Jell-O Pumpkin Spice instant pudding mix in the store last fall and thought I could do something with it. I’ll admit I don’t get excited about all the pumpkin stuff on the market in the fall. It’s just not one of my favorite flavors, nor is it in the top 25 probably. But my daughter and her husband love pumpkin stuff and I thought I’d play with the pudding mix somehow. This Hornet’s Nest Cake came to mind, because I think you could change it up to use whatever flavor pudding, cake mix, and type of nuts you like and come out with something that is both easy and impressive. 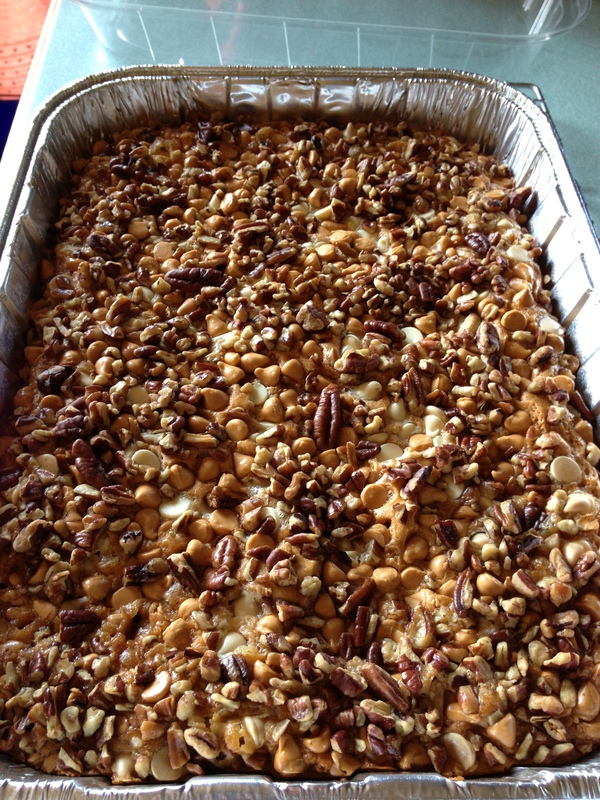 So I went with pumpkin spice pudding, a yellow cake mix, a combo of butterscotch and white chocolate chips, and pecans. I thought it was good, but Tish and Alex liked it even more and requested it a couple times after that. Click for recipe. The cake is moist, and the top layer is both sweet and crunchy, as the chips and nuts stay near the top of the cake and the nuts brown a bit. I haven’t checked the stores to see if the pudding is out yet, since it’s seasonal, but I’d guess it’ll be there soon if it’s not already. I was lucky and had stocked up at the end of last year’s holiday season so I still had 1 box stashed away. If you can’t find pumpkin spice pudding, try butterscotch or maybe a butter pecan, if there is one, and add some pumpkin pie spice to the pudding mixture. Alternatively, use vanilla pudding and a spice cake mix, and add pumpkin pie spice to either the cake mix or pudding. I’d start with about a tablespoon of the pumpkin pie spice, smell and taste your mixture, and add more spice if you think you want it. I delivered the cake to Alex last weekend and he declared it, “All mine!” Since we didn’t cut it while I was there, I can only show you a picture of the un-cut results. But trust me on this one – it’s a really delish cake that takes maybe 5 minutes to throw together. Give it a try and let me know if you make any variations to Alex’s version!